The city of Detroit has filed for federal bankruptcy, or Chapter 9 protection, which could mean municipal employees are laid off, assets sold and services like trash collection, which have already been cut to the bone, further scaled back. 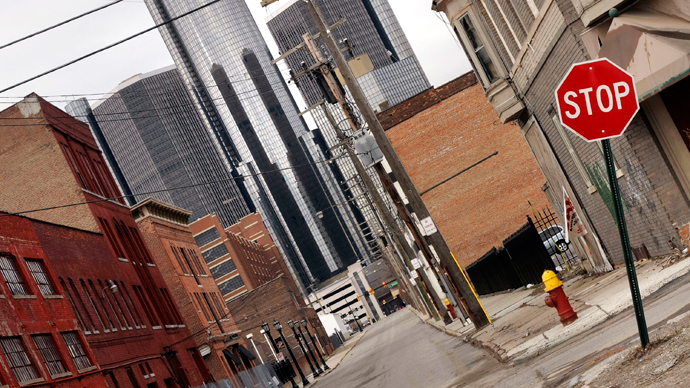 Detroit has become the largest city in American history to file for bankruptcy. Kevin Orr, a bankruptcy expert hired by the state of Michigan in March to try and lead the Motor City away from a fiscal cliff, submitted the filing on Thursday, reported the AP. On the same day, Michigan governor Rick Snyder laid out the case in support of Chapter 9 protection, saying that the “decision comes in the wake of 60 years of decline for the city." Snyder said that despite the “best efforts” by Detroit’s Office of the Emergency Manager, the city was unable to reach a restructuring plan with its debtors - leaving more than $18 billion in outstanding debts. "We must face the fact that the city cannot and is not paying its debts as they come due, and is insolvent,” added Snyder. The city of Detroit lost a quarter-million residents between 2000 and 2010, reports the AP. Boasting a population of 1.8 million in the 1950s, the municipality is now struggling to stay above 700,000 residents. An estimated 78,000 structures are currently abandoned in the city and unemployment has tripled since 2000 and, at roughly 15 percent of the population, is currently double the national average. In addition to a severe loss of population, the city faces a host of issues hampering its economic recovery including a 47 per cent delinquency rate on property taxes and a murder rate at its highest in nearly 40 years. Detroit’s tax rates are already at their 'legal limits,' while city expenditures have surpassed revenue for six consecutive years. According to Orr’s Thursday letter, negotiated settlements with the city’s creditors are not possible outside of bankruptcy “given the vast and fragmented pool of potential creditors." In June Orr met with some 180 bond insurers, pension trustees, union representatives and an assortment of creditors and asked them to take about 10 cents on the dollar for the city’s debt, reports the AP. The Washington-based bankruptcy attorney hired by Michigan in March had said then that the chances of bankruptcy for Detroit were 50-50. "The average Detroiter has to understand this is a culmination of years and years of kicking the can down the road," Orr said. Detroit had for years relied on borrowing and deferred payments to its pension funds to keep the city afloat.